How Can Apples Help for Weight Loss? Apples are one of the most consumed fruits around the world. As one of the healthiest foods, it is no wonder why more and more people are listening to the old saying “an apple a day keeps the doctor away.” With a high amount of dietary fiber, antioxidants, flavonoids, and phytonutrients in apples, they can be incredibly beneficial to your overall health. While they may help prevent cancer, diabetes, heart disease, and many other health conditions, apples for weight loss may be something you have never thought about. How does it help then? Keep reading to learn more. Why Does Apple Help for Weight Loss? A medium-sized apple contains about 95 calories and is made up of 85% water. The water content of apples can help reduce the number of calories you consume each day since the water is filling. Apples are also considered to be a low energy density food. Low energy density foods can help you lose weight since you feel full for longer periods of time without consuming many calories. Energy density is determined by how many calories are in each gram of food. Since a majority of an apple is water, which has a 0 energy density, you are not adding excess calories in your diet. Research has pointed out that consuming high fiber foods with a low energy density results in consuming fewer calories when compared to eating high-fiber foods that have a high energy density. With four grams of fiber, a medium sized apple can supply you with 16% of your daily recommended fiber intake. Fiber can help slow down the digestive process, keeping you full for longer, which results in you eat fewer calories through the day. The healthy fiber in apples can also promote the growth of friendly bacteria in the gut which helps improve the digestive tract. When your digestive system is functioning properly, you can better control your weight. As mentioned, the fiber and water content of apples can help keep you feeling full throughout the day. What also makes them great to suppress your appetite is they take a while to consume. Eating apples for weight loss can be effective since the longer it takes to consume the apple, the fuller you will feel. 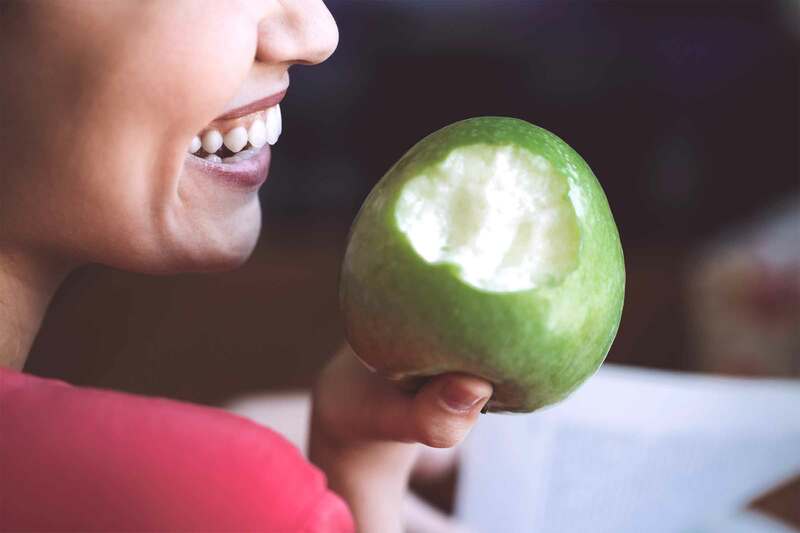 A study that focused on overweight women showed that an increase in weight loss can be accomplished when apples were included in a low-calorie diet. Including apples into a well-balanced diet can promote weight loss. There were two studies conducted involving two test groups, one that consumed apples and another that consumed oat cookies. In both studies, those who were in the apple test group lost over two pounds in a 12 week period. Those in the oat cookie test group showed no weight loss.These studies also showed that those who ate the apples consumed at least 24 fewer calories a day than those in the oat cookie group. Research has also shown that increasing fruit intake, especially those rich in antioxidants like apples, also increased the number of weight individuals were able to lose over a longer period of time.Apples do not just benefit adults trying to lose or manage their weight, but are also beneficial for children who are obese as well. While raw apples are highly recommended to include in your diet, cooked apples will not provide you with the same amount of benefits. When an apple is cooked, those nutrition in apple pies or apple crisps like the polyphenols become destroyed, making them less effective for weight loss. Eating apples for weight loss can be accomplished by giving this five-day apple diet plan a try. *consume up to 1.5kg of apples on day 1. Lunch- Green salad with lemon juice and low-fat cheese (2 slices), 1 apple. Dinner - Whole grain cereal with nonfat milk, 1 apple. This diet plan greatly restricts your caloric intake. This low-calorie intake can leave individuals feeling weak and can also cause other side effects. Nervousness, irritability, headaches, and dizziness are all common side effects from consuming too few calories each day. Consume so many apples over the week can increase the chance of gastric hyperacidity. Sticking to this diet plan for the full five days can be highly beneficial, but after the five days, many people find themselves overeating. Therefore, this diet of apples for weight loss increases the chances of putting back on the weight soon after the diet plan has finished. So be firm. Do You Grow Taller When You Lose Weight? What Happens When You Don't Eat Enough?